I feel like I have a lot to write about today. Not sure why but all of it is bogging me down quite a bit. I’m growing restless, impatient, frustrated, anxious, and uneasy. I no longer feel steady like I did yesterday. I feel restless because I have a lot of inner energy radiating out that burns. The kind of burns that wound and become infected, not the burns that cauterize and sterilize. The toxic energy keeps spreading within me. I’m impatient, because like any person who was once a child, I want everything I want NOW. I want to skip past all the hard work and navigating the path through dense jungle, and just be there now. Life isn’t supposed to be this hard. Am I really asking too much after the past I’ve endured and the endless recovery from it? I’m frustrated because things happen not the way they I feel should have. I’m frustrated for many other reasons. I’m pretty much alone without my family and online friends. I have no job. I have no life. I’m out of shape. I’m too lazy to do much about it. I have great ambitions with no clear path how to get there. Suicidal thoughts creep in once in a while. I don’t want them there at all. I’m anxious I’ll never measure up to anything worthwhile or be happy about my life. Ever again. Right now, I’m in the “Waking up” stage. 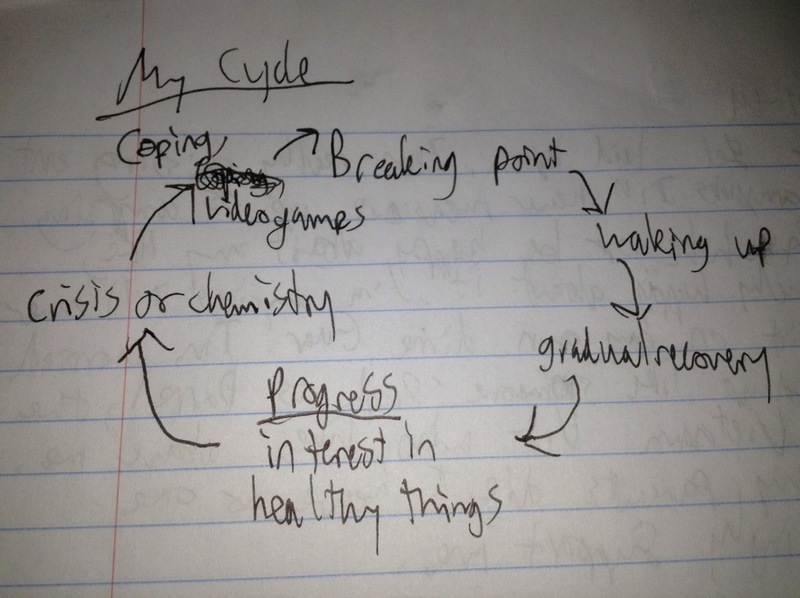 I’m past the “Breaking point.” How do you break this cycle? I haven’t figured it out yet, but the progress and recoveries are cumulative over time, never starting again from square 1. However, every “Breaking point” is perilous.